Director: Christopher Landon / Writer: Scott Lobdell / Cast: Jessica Rothe, Israel Broussard, Ruby Modine, Rachel Matthews, Charles Aitken, Caleb Spillyards, Blaine Kern III, Rob Mello. 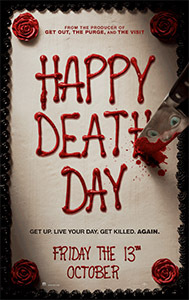 It would be impossible to forego mentioning Groundhog Day in the same breath as Happy Death Day - ostensibly the same idea, but staple-gunned to a slasher-lite opus. At Bayfield College, self-centered sorority girl Tree (short for Teresa) wakes up hungover in the dorm room of sweet-natured Carter, grabs her clothes and a Tylenol, and is outta there. She walks by a girl trying to sign her up for an environmental campaign, sprinklers soaking a couple, a frat boy keeling over, a needy ex, and gets home to her sorority, where the bitchy house president Danielle is quippy with her, and finally rejects her nice roommate’s attempt to give her a birthday cupcake. Tree goes through her day, classes, getting naughty with her professor, and then heads off for a frat party. Alone. Down dark areas of the campus. In a short tunnel, Tree encounters a creepy music box playing ‘Happy Birthday’ and is attacked and killed by a loon in a baby-faced mask that matches the school mascot. Then she wakes up in the dorm bed. As most of us probably would, Tree stumbles through the day writing it all off as deja vu. This time, she sees the music box and goes the other way, making it to the frat house, where it turns out the party is a surprise for her birthday and, this time, ventures off upstairs with a guy, who is murdered before she is attacked a second time and killed with a shattered bong. Then she wakes up again. And again. And again. Tree is knifed, struck with a baseball bat, drowned, and hit by a bus as she tries to work out who it is who’s after her and why. With Carter’s help – after she’s convinced him each morning – Tree knocks names off the list of suspects and goes about making reparations to her unruly life, reconnecting with her estranged Dad, apologising to her suffering roommate, and ending the affair with her teacher. But who is trying to kill her and why? Happy Death Day‘s eventual revelation is a tad contrived, but at the same time I didn’t guess it correctly, so perhaps I’m just being picky. It helps that Tree’s resurrections aren’t unlimited – each time she wakes up she’s weaker than yesterday, so the clock is ticking on solving the mystery before she’s gone for good. While almost entirely bloodless (it was a PG-13 Stateside), what murders there are besides Tree’s happen mostly to schmucks who get in the way of the killer and are undone each new dawn, resulting in a ‘real’ murder count of, well, none. It’s still a slasher film of sorts, in the same way April Fool’s Day is, despite not being… kinda? Katie Cassidy-a-like Rothe is great in the lead role – balancing comic timing with final girl aplomb and going from nasty victim-type to appreciative heroine over the runtime. Rachel Matthews as bitchy Danielle is also a hoot and gets most of the best lines. A fun diversion, checking most the boxes Camp Daze failed to, and a surprising box office success that will hopefully trailblaze the way for some more theatrical slasher flicks, although whether audiences will embrace straight-up stalk n’ slash over this kind of concept remains to be seen. Nice review. Sounds like you quite enjoyed it. This is a bit of a spoiler for those who haven’t seen it but I think there was actually one legit kill which did count which was Lori towards the end when she fell from the window. That one was legit as I think the time repeating itself cycle came to an end once Tree worked out who it was and put a stop to them so the Lori death would have remained and not been reset. Yeah, y’know, I don’t get some of the hate this movie is getting. I sincerely enjoyed this one and I’m glad to see you did, too!